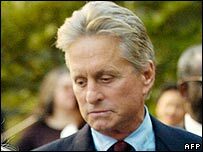 Hollywood star Michael Douglas has revealed he is to receive an honorary degree from St Andrews University. The Oscar-winning actor will be made a Doctor of Laws in June, a spokesman for the university confirmed. University officials said Douglas was being recognised for his "outstanding contribution" to British film. Principal Dr Brian Lang said: "A major figure in contemporary cinema, he is a major film producer, movie actor and frequent visitor to St Andrews." Dr Lang added: "The event will be all the more timely given the forthcoming official launch of the university's department of film studies." Douglas, son of Hollywood legend Kirk, starred in Basic Instinct and Fatal Attraction and won his Best Actor Oscar for Wall Street. He and his Welsh actress wife Catherine Zeta-Jones are both golf fanatics. They are regularly spotted in St Andrews, both on and off the famous Old Course. Speaking in Los Angeles, Douglas said: "Three years ago, I was at St Andrews and they asked if I would do a Q & A with the students. "I had never seen so many beautiful women in my life. "I then found out that Prince William was at the school. That was a time to be there."